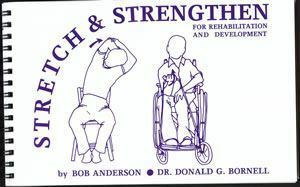 This spiral bound book instructs the disabled and elderly in simple stretch and strengthening exercises appropriate for individual rehabilitation and development programs. The strengthening exercises are done with an Iso-Band (circular elastic band with tubular handles). The Iso-Band is no longer available so we have substituted a medium resistance exercise tubing (containing latex). Dr. Donald G. Bornell has worked in and observed physical education and recreation programs with people of all ages and abilities for 30 years. His own program: “Movement is Individuality, an Interabilities Approach” for handicapped and non-handicapped side-by-side participation, has evolved from his extensive work in the area.